This proposal would go far beyond the provisions set out in the Roe v. Wade decision, by removing our state’s current limit prohibiting abortions after 24 weeks of pregnancy, permitting non-doctors to do abortions, eliminating all penalties for abortion – so even if an abortion was involuntary or coerced, or if the unborn child was targeted for an act of violence, it could not be prosecuted as an illegal abortion – and would allow abortionists to let die from neglect and starvation any child born alive during an attempted abortion. The blood runs cold just thinking about it! In recent years, we have advocated fervently for our elected officials in Albany to pass the Education Tax Credit legislation, which would substantially assist parents in covering the cost of tuition. Despite enjoying early support from Governor Cuomo and the majority of legislators, the Assembly leadership backed away in deference to the powerful public school teachers’ unions. More recently, the governor publicly stated that private schools in New York would receive a three percent increase in state reimbursement for “mandated services,” those activities, like standardized testing, that the state requires our schools to perform. In reality, the proposed budget will actually cut state funding to many Catholic schools by an average of four percent! This would not have been the case had the governor not vetoed legislation to restore the funding formula to our schools, something he had earlier laudably supported. Unless the formula is restored, additional costs will be passed on to our schools and families. This is especially egregious when you consider the amount of money Catholic schools save taxpayers every year through the sacrifice of tuition-paying families. We do not want any other of our beloved Catholic schools to close. Our elected officials tell us neither do they. But our schools need the promised mandated services revenue to keep going. In 2015, the bishops and Catholic families statewide praised the governor for appropriating $250 million to help settle long-standing delinquencies in state reimbursement to non-public schools. Unfortunately, the current budget proposal would require the schools to give some of that money back. Our schools had already budgeted the money, due them by law. Editor’s Note: The New York State Catholic Conference, the representative of the bishops of New York State on legislative matters, has issued action alerts on each of these items. If you’d like to let your elected officials know your feelings on these matters, visit www.nyscatholic.org and click on the Take Action! link. 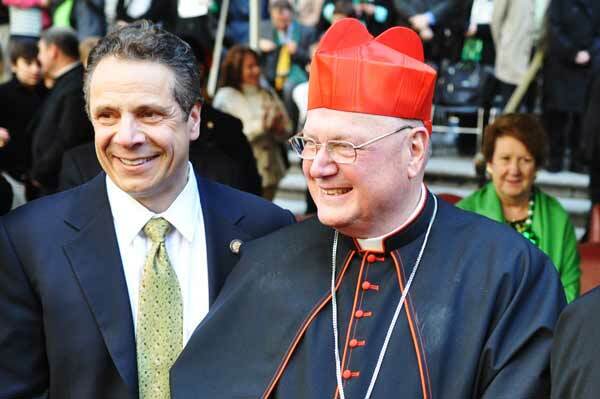 But, of course, Cardinal Dolan and his ilk, such as Bishop DiMarzio, will continue to do nothing to truly challenge pro-abortion “catholic” politicians such as Governor Cuomo, other than media sound bites to give the guise they are actually doing something. I am sure the attention loving Cardinal will, once again, “high five” Governor Cuomo in St. Patrick’s Cathedral, mocking the sacredness of the building and giving a not so implicit endorsement of the Governor’s anti-Christ positions.